Nothing says classic American comfort food to me like a homemade chicken pot pie. It’s so hearty and filling, and always feels good on a chilly fall or winter day. But traditional chicken pot pie recipes can be pretty high in fat and calories. By making a few changes and using a reduced fat crescent roll dough for the crust, I was able to create a chicken pot pie recipe that tastes every bit as good as it’s more fattening version. My husband absolutely loved this Weight Watchers recipe, and I take that as the ultimate success indicator, since he is pretty picky. 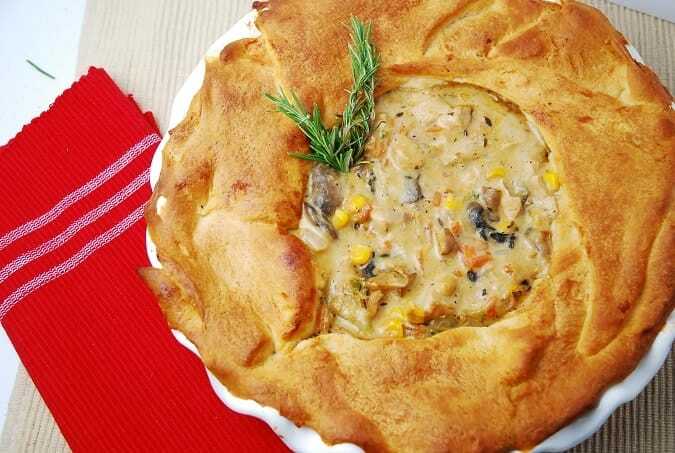 This low calorie Chicken Pot Pie Recipe is a fantastic bargain. Enjoy! Low calorie comfort food at its finest, this reduced fat Chicken Pot Pie is hearty, creamy, and ever so satisfying. Perfect for a cold winter’s day! Preheat oven to 375 and spray a 10” pie plate with cooking spray (butter flavored is best). In a medium sized pot, melt butter over medium high heat. Add in onions and celery and cook until tender, about 3 minutes. Add in mushrooms and cook for another 3 minutes. Stir in broth, chicken, vegetables, paprika, thyme and salt and pepper. Cover and simmer on medium for about 12-15 minutes. In a small bowl, whisk together the evaporated milk and flour. Pour into chicken and vegetable mixture and continue to cook on medium heat, stirring constantly until the sauce is thickened, about 3 minutes. Pour mixture into prepared pie plate, and arrange crescent roll slices around the outside edge, leaving the pie open in the center. Place into oven and bake until the crust is golden brown, and the center of the pot pie is bubbly, about 15 minutes. Let cool 10 minutes before serving. I made this last night. It was a hit! Thanks for your wonderful recipes! So glad you liked it!!! Thanks for reading! You calculated this at 8 servings (169 kcal ea) so FS points are incorrect. Thanks for catching my mistake!I’ve been trying to update old recipes, and somehow two recipes got crossed! Thanks for bringing it to my attention. The correct number of servings is 6. The post has been updated with corrections. I made this last night using leftover rotisserie chicken breast. It had so much flavor, was so easy, tasted absolutely delicious, and my husband and I both loved it! I have to say that I did make a big error though. I rolled the crescent rolls up into crescents and placed along the sides of the chicken pot pie – needless to say only the top of them cooked, and the rest was raw! Dumb me LOL The saving grace of my mistake was that we ate less of the crescent rolls, thereby likely reducing the points value. Thank you so much for sharing such a delicious recipe! I’d like to make this ahead and freeze it. Have you tried that? Wondering how well it freezes. What mix of veggies do you suggest?? Question about the crescents.. Do you layer them at the bottom of the pie plate too or just on the top? If it is just on top, how do you get an even “slice” since I’m assuming the mixture inside is consistency of soup. Thanks!! The crescents are used just on top. But yes, you are right about it being difficult to get an even slice. When I make it, I just immediately divvy it up into 6 serving bowls, making sure to eyeball an even amount into each. Then, whatever servings are leftover, I wrap them up and refrigerate for the next day, so I have a portion controlled meal ready to go. I made this tonight and it was delicious! The whole family loved it. So much flavor and very satisfying. Will be making again….soon! Thanks for the recipe. My question is this…I have a large family so if I use a bigger dish and double the receipe how much exactly is one serving? Do you know? Is it 1 cup, or 8oz is there a way to decipher that so I can make more of this but still only eat 1 serving size? I don’t know what the exact serving size is…I’d estimate about a cup. But to be 100% accurate Id suggest calculating all of the nutritional stats for the amount of the ingredients you use, and then divide it by the number of servings that you choose to cut it into. Why does the recipe say cook for 15 min but at the end it says total cooking tie is 45 min? Can you explain what you mean by slices? Are you simply saying open up the crescent rolls and use 4 of the pieces or slice 2 pieces in half making 4 pieces. I hope my question doesn’t sound stupid!! Not a stupid question at all! Let me clarify…when you open the rolls, you’ll see that the “slices” are separated by perforated lines. They each look like a triangle. There are usually 8 “slices” per package. You’ll only use half the the package for this recipe. I have been CRAVING chicken pot pie for the longest time! I tried this recipe a few days ago and since then have been sending links to your blog all over the place. Really tasty & perfect cold weather comfort food. I also think it’s great on those days that you are REALLY hungry b/c you get a huge portion for 4 – 6 points. I think you mean evaporated milk instead of condensed milk. Sounds great! Weird, the email I got had no butter listed but when I go to your webpage, it’s listed there. Wow! Sounds yummy. Perhaps, though, you meant to say “fat free EVAPORATED milk” instead of “fat free CONDENSED milk”? I did! Yes…major typo there….thanks for catching that! I’ve corrected it.